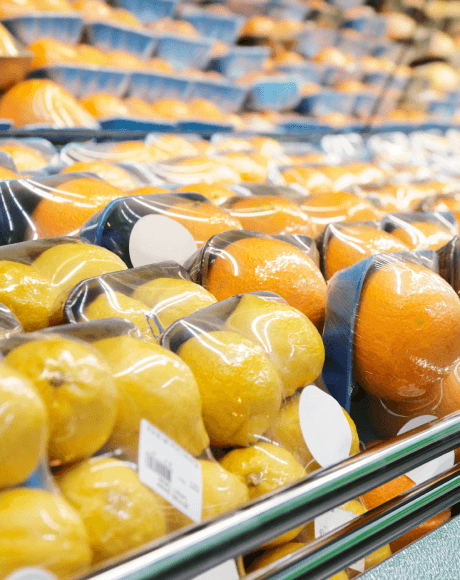 We recommend our ONGROFOL®INDUSTRIAL stretch films for both manual usage and automatic packaging application. ONGROFOL® INDUSTRIAL stretch films manufactured by Ongropack Ltd are fully in compliance with the relevant European directives. When determining product composition, EC regulation No. 10/2011 on plastic materials and articles intended to come into contact with food was taken into consideration. Accordingly, our product is suitable for packaging of alimentary products in X2 and X3 food categories. Besides of the traditional natural INDUSTRIAL films are also available in champagne, salmon and lilac colours. Owing to its excellent mechanical properties, the film can be easily applied on automatic packaging machines for tray packaging of foods such as fruits, meat, cheese and bakery products to retain their freshness, thus assuring a longer shelf-life in stores and supermarkets. The film can be applied for refrigerated products, as well. All of our ONGROFOL® INDUSTRIAL products contain anti-fogging additive to ensure better visibility of the wrapped food. The film is available in a wide range of sizes with different parameters of thickness, width and length.